39 Wemyss Street, Queen's Arcade, Glasgow. Wemyss Street was once called West Russell Street and the pub sat at one entrance of the Queen's Arcade, an ancient shopping arcade, at the other end of the arcade you had another pub called the Camp Bar. There has been a public house on this site since the 1870s occupied by renowned wine & spirit merchant James Dewar, he also had licensed premises at 247 Duke Street, 1 Port Dundas Road, 225 New City Road, 227 Cowcaddens and 48 Commerce Street. In 1898 William Craig acquired the licence. William was born in Kirkfield Burn, Lanark and came to Glasgow in 1881. His father William and family all worked as carpet weavers. When William came to Glasgow he worked for a short time in the railway, but gave this up to work with his uncle, Samuel Aitken, a wine & spirit merchant in both Duke Street and North Woodside Road. Samuel also came from Kirkfield, Lanark, he lived in Greenock for a short spell before coming to Glasgow to set up a home in North Woodside Road, with his wife Elizabeth and a large family of five sons. In 1877 he acquired the licence for premises at 262 North Woodside Road near to he residence. William Craig joined his uncle in the Duke Street premises and was soon managing the premises. On the death of his uncle William became the new proprietor for Duke Street. In 1898 William was the new landlord on the Arcade Bar, West Russell Street at the entrance of the Queen's Arcade. The Duke Street premises were lost as a result of Dennistoun Ward Voting Limitations in 1920. William concentrated his efforts into one licence. He was a member of both the St. Rollox and Uddingston Bowling Clubs, this took up most of his spare time when he wasn't serving his customers behind the bar. William also owned licensed premises at 60 Eglinton Street. William recalled the old days when children of tender years used to come for father's refreshments and the heavy duty on whisky was from 10/6 to 72/6 per proof gallon, restrictions that were imposed after the war dealt a crippling blow to the trade. Even before that the writing appeared on the wall when opening hours were cut down from 8am to 11 pm to 10 to 10 each day, these changes were welcomed by some and deplored by others. At the same time they were privileged people when it was remembered how the permitted hours were restricted during the war and how they were curtailed to 8 per day by the 1921 Act. Another well known and respected member of the Scottish Licensed Trade to own this pub was James Millen, he took over after William Craig. James Millen also owned the Abercorn Bar, 26 Abercorn Street, he also became hon. president of the Ashfield Football Club, the trophies were proudly displayed in the pub. Cups and trophies gathered on the gantry, a proud event when the football club won a tournament. 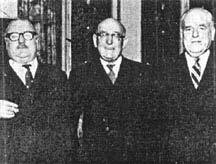 Mr J McCabe, Mr J Millen and Mr Malcolm MacLeod. The Arcade Bar was refurbished in 1956, outside the Wemyss Street frontage was made up of Napoleon and Patricia marble on a black granite base. The arcade entrances used the same marbles, relieved by glass brick windows and fluted teak on the walls of the lounge. Inside the public bar a decor of oak panelled walls. The oak fronted counter with a formica top blended well into the new decoration and a remodelled gantry. Above the mirrored oak gantry was a floodlit which passed over the mural panel representing Wemyss Street and the Queen's Arcade in the early days of the 19th century. Another reminder of old Glasgow was tiling incorporated into one wall of the Arcade Bar, picture tiles which were once a showpiece on the outside wall of the bar. The bar ceiling was in red with primrose frieze, upholstered red wall bench seats were a new feature in the bar. The lounge was small and cosy with high ceilings, panelled oak walls with red bracket shade lighting and red upholstered wall seating. The grand opening was performed by John Taylor M.P. for the West Lothian District and well known Scottish Licensed Trade president Thomas Flynn. When the bar was demolished no-one saved the set of Tiles depicting the Trades of Glasgow which were displayed in the Gents toilets. A very sad day. 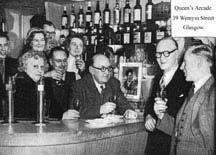 Interior view of the Arcade Bar at the opening of the refurbishment in 1956, Mr & Mrs James Millen behind the bar with staff with John Taylor M.P. on the right with Thomas Flynn. James Millen behind the counter of the Abercorn Bar, note the cups and trophies' on the gantry. 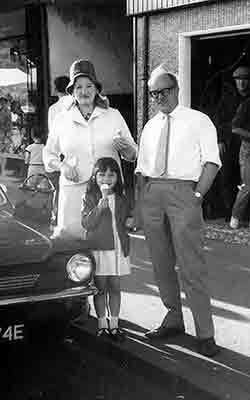 Jimmy Millan with Margaret and Angela Hull. An outing at Helensburgh in 1969. If so please contact me and I will view your comments. Mr James Millen. 1960s. A Glasgow delegate, who had been a member of the management committee since 1953.